Sell Used Books Online - Part IIEliminate The Muda! « Are Debit Cards Secure – Debit Or Credit? 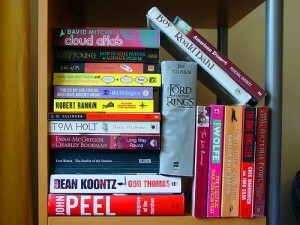 On September 17 I posted an article called Sell Used Books Online – Get The Most Value. In this post I explored the options for getting the most value out of any inventory of books we have. After reviewing the options of used book stores, Amazon, Cash4Books.com and Half.com it was obvious that my greatest opportunity for maximizing revenue was via Half.com. Short of being able to sell our books I will revert to donations to the local library, our children’s schools or other charities we deem worthy. The listing process on Half.com only took a little over an hour and a half to get 112 books online. In the 30 days since listing them we have sold a total of 14 books for $46.89 to 7 customers. Shipping has costs us $21.43 including packaging leaving us with $25.46. With the exception of one hard-cover book with expedited shipping which we lost about $1.50 in shipping all were sold at a “profit”. Profit in this case only means a profit over the cost of shipping. In our case, until a couple years ago we always bought books new. Today we supplement our reading habits at the used book store, library and of course Half.com. Our other option, donations, would have provided about $25.00 in tax write-offs. Or roughly speaking would have put about $6.25 of actual cash in our pockets. Honestly, if $25.46 is all we got out of this effort, Uncle Sam can subsidize our donations. But with another 101 books remaining and dozens more around the house that could be listed I’m going to continue the Half.com effort. Is it realistic that we will keep up the pace of 14 books and $26 profit each month? I can’t imagine so, but selling the remainder of the books would be worth nearly $200. That is still much better than we will get from a tax deduction, so it is worth the effort required to leave them listed.